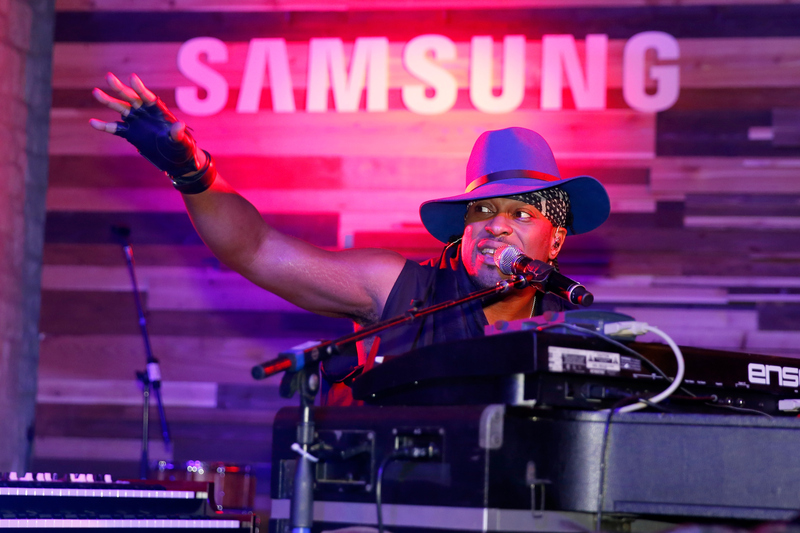 Following a sit-down dinner, D’Angelo will perform music, new and old, on the roof of a building in Austin during SXSW at an event sponsored by Samsung. There are only a few appropriate responses to receiving that information: What? HOW? And WHY? Either way, what’s true is that there is a shift taking place at SXSW that will hopefully be felt beyond Texas. So much of what defines this 10-day beast of an event is the in-your-face, all-out assault by corporate brands attempting to distinguish themselves. The most common strategy at SXSW is hiring musicians to perform at a brand’s event. In the previous three years I’ve attended the festival, Sure, why not? often appears to be the organizing thesis of these events. The idea is that because you can, you should. That’s why some people have stopped coming to Austin every March and why other people are still addicted to coming to Austin every March. It’s why cynicism surrounds SXSW, even when you’re at SXSW, enjoying SXSW. It’s because there seem to be no rules and zero accountability. Big checks, but no checks and balances. It’s a place that routinely forces you to make this decision: Is it better to see a show in a less-than-ideal setting or not see it at all? Yes, I’d love to see Lil Wayne, but do I really want to sign up for the Camel Crush mailing list first? Sure, interviewing LL Cool J sounds fun, but how many pictures do I have to take with bags of Doritos first? HAIM AND RINGO STARR? Can’t miss that, even if it means I have to hear someone tell me about how the BlackBerry Side Scroll is making a comeback. Only one of those examples is true. But LL Cool J did perform on a stage built to look like a giant Doritos vending machine in 2013. That actually happened. That’s SXSW. When these collaborations happen, it’s easy to scoff. The excitement from brands never seems to quite match up with the soul-crushing curb stomp you can see in the eyes of the artist performing. It makes you want to freeze time and tell the artist who is doing that thing for that brand to run away and never return. But you also want that artist you care about to get that check. Because those checks aren’t coming from the music industry in the same quantity and with the same frequency. So then you’re back to square one. And then you unfreeze time. And continue watching the show. Walking into this weekend’s D’Angelo show, excited and worried, I thought about a moment at SXSW two years ago, when I nearly gave up on SXSW. I thought I’d reached my breaking point. The point when you say, out loud, I’m never coming back. I was trying to see Passion Pit. There were two ways I was going to get into this show, through the artist’s side or through Option B. Option B was easier, but Option B was going to bum me out. Option B could handle the situation in about 10 minutes, but Option B was going to be the death knell of me pretending the music industry was in any way controlled by those making the music. But going through the artist’s side was proving difficult. So it was time for Option B. 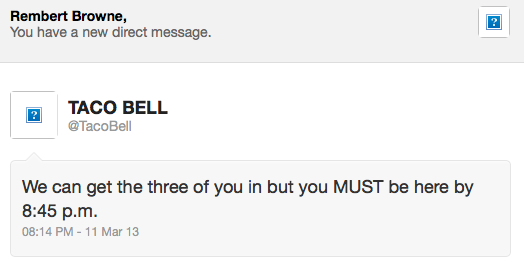 Option B was sending DMs to @TacoBell. And then getting responses from @TacoBell. I’ll never forget this dark evening in Austin, feeling at the mercy of the person manning the Taco Bell Twitter account in order to hear Gossamer. But I came back, again, to Austin. And three days in, I was just a Questlove DJ set away from seeing D’Angelo. Yes, there are numerous ways in which this setting isn’t ideal for an artist like D’Angelo, a perfectionist. This wasn’t the Apollo. And the crowd may not be well-versed in his music. But my hope was based on a small recent trend in which some of these once-musical brand entrapment scenarios had begun to feel like something resembling a partnership. In the past six months, I’ve witnessed Kendrick Lamar play on an island — located in what was temporarily named the Bacardi Triangle. I’ve also seen Prince play a surprise set during NBA All-Star Weekend for a party sponsored by Jordan Brand. Prince and Kendrick are perhaps the least likely artists to compromise for anything, especially a brand. But both did it, and both performances were fantastic. The two seemed to be enjoying themselves in those settings. It felt like a concert stop on one of their tours, so much so that you forgot about Bacardi and Jordan Brand. It didn’t feel like Bacardi featuring Kendrick Lamar, it felt like Kendrick Lamar, brought to you by Bacardi. And it didn’t feel like Prince and Jordan present; it was very much just Prince, until. The difference may seem small, but it’s huge. Because it acknowledges the purposeful backseat the brand is taking. It’s a self-awareness, an ego examiner, a new way of being distinct. As Prince ended a few of his songs, he’d say, “You’re welcome.” In the moment, it felt like he was saying it to the crowd, but it was also appropriately directed at Jordan Brand. He was right: This wasn’t about Jordan Brand, it was about him. And as cocky as it is, everyone in that room knew that Prince was right — that he was the reason everyone was having a memorable time. The D’Angelo set was five songs. Each was long, but it was still only five songs. And it was near flawless. The space had been set up to feel like a lounge, with chairs surrounding long dinner tables, and when he hit the stage, the collection of about 200 people lit up, ready to dance and sing along. His performance immediately mirrored the crowd’s reaction to his presence. The crowd was engaged, so he was engaged. People actually participated in his call and responses, the This side of the room do this, this side of the room do that routine. People would get their picture or quick video in, but for the most part, the room was focused less on documenting and more on taking in D’Angelo for as long as he felt like playing. He went from “Betray My Heart” to “Spanish Joint” to “Really Love” to “Send It On” to “Brown Sugar.” His live vocals are somehow more crisp than the professionally mastered studio version. Having not seen him perform in almost two years, right as his comeback rumors began to swirl, it was startling to see this executed so well. Samsung didn’t just get an artist, it got the right artist, it got the right collection of people in the room, it got the right setting. It felt like an example of a brand taking a real look at itself, acknowledging the idea of taking a backseat to the performer by admitting “no one’s here for us.” The shift is the brand working for the artist as much as the artist is working for the brand. In that shift, the branded assault is still there — look at the neon sign above D’Angelo’s hat — but it’s getting savvier and less intrusive. The intense activations one needed to experience simply to gain admission is now giving way to more subtle tactics to get inside your brain and deeply affect your purchasing decisions. It’s unclear whether this benefits the brand, but for the artist and the fans, it’s a welcome change. This is a new moment, but it’s gradual. A brand like Samsung has been at it for years, at SXSW and elsewhere. Perhaps it’s wising up. Historically, SXSW has been a place to break out. Apps catch on, musicians go from nothing to something in just a week, little-known films begin to buzz. So in the place where the toxic relationship between brands and music reached its most insufferable point, it’s only appropriate that this also become the place where that tension is released. Destroy and rebuild. This post has been updated to correct the year of the Taco Bell–sponsored Passion Pit concert at SXSW.